Sorted above problem I just added all the scrapers, takes longer buts its sorted. Un-marking the marked movies is painfully slow! I had 1220 movies. Added some more sources and after EMM scanned in those new movies, I had 3215. I have an option to auto-mark new movies. That means 1995 new marked movies. It took 10 minutes and 43 seconds! There's something seriously wrong here. If I'm not mistaken, marking movies is 100% in memory, isn't it? Why the hell does it take so long? Does this run on WINE on Ubuntu? I don't like any of the Linux compatible managers. (2018-09-09, 00:19)bonelifer Wrote: Does this run on WINE on Ubuntu? I don't like any of the Linux compatible managers. The show is My Little Pony: Friendship is Magic. I have the filenames listed as "SxxExx - Title.ext" and for some episodes, after scraping in EMM they were attached to .nfos appropriately with the correct episode title. The show was recognized in EMM but, while some of the episodes had .nfo's created (by EMM) with the appropriate title, the majority were named (in the nfo) as "My Little Pony Friendship is Magic SxxExx". The file names remain unchanged as expected. Not sure why this is happening. I checked the official titles and they are named according to the official titles. Can anyone clue me in? When scraping a video, if I clear the Plot outline field in the preview and click OK, I get data from the next scraper. If I now click OK, I get to the Edit movie dialog, but the content from the first scraper is prefilled. Is it possible to get the output from the chosen scraper? For example, IMDB title tt7514782 has just some filler text there while TMDB has normal info. With music videos, it's quite common that IMDB doesn't find the title and TMDB would, but the scraper won't let me bypass IMDB. I guess the option to bypass a scraper was already in the pipeline? Has anyone tried to setup Sonarr to run Ember when it downloads a new episode? I tried setting it up and every time Sonarr launches Ember, it gives a "object reference not set to an instance of an object" error. Oddly, if I have Ember open already, it works fine. 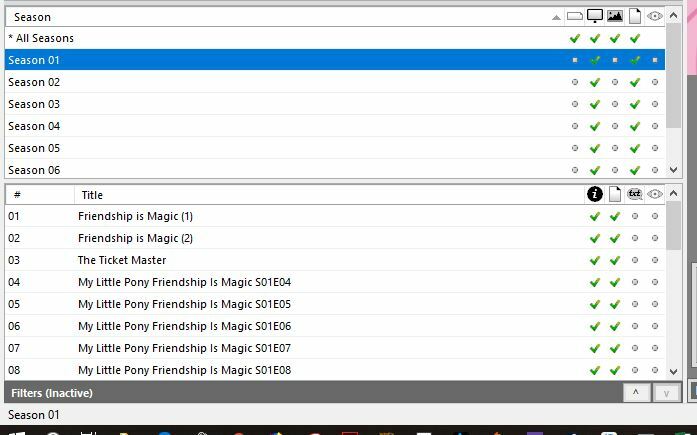 (2018-09-14, 23:55)tr0nllam Wrote: Has anyone tried to setup Sonarr to run Ember when it downloads a new episode? I tried setting it up and every time Sonarr launches Ember, it gives a "object reference not set to an instance of an object" error. Oddly, if I have Ember open already, it works fine. Perhaps you are calling ember without -nowindow parameter? I used to have it setup this exact same way and I swear it worked, so I don't know what's going on. 2018-09-14 16:20:15.0785,Ember_Media_Manager.My.MyApplication,Ember_Media_Manager.My.MyApplication.MyApplication_UnhandledException,1,ERROR,EmberAPI,"EXCEPTION OCCURRED:System.NullReferenceException: Object reference not set to an instance of an object. My apologies if this has been addressed previously but I searched the forum and didn't find anything. The problem I am seeing is related to multi part movies where there is at least a Part1 and Part2 mkv file. The <durationseconds> field in the .nfo file is only taking into account the Part1 file. Ideally the different parts should be totaled and have the sum populate the field. Is there a setting I may not have set properly or this a bug in EMM? There seems to be a path substitution missing, as the correct path for this TV series on my Kodi Greatroom box (LibreELEC; Linux) is ' ""/storage/tvshows/Killjoys/"" ' - the ' ""S:\Media\TV Shows\Killjoys"" ' path is on the Windows host EMM is running on. (Both paths point to same location on server.) Episode data is being scraped, but is this causing unnecessary calls to the Kodi DB, or just covering all possible paths? Using the Aug 23 Alpha from Komplex. I'm still in vacations, be back next week. I have a TV episode with the name: "Disney Animated Shorts - S1950E07 - Trailer Horn.mkv". EMM will not scrape this, I assumed because of "trailer" in the name. However, I have another episode named: "Disney Animated Shorts - S1938E06 - Mickey's Trailer.mkv " and that scrapes just fine. Any idea why this is happening and how can I resolve it.